It feels like it's officially the beginning of entertaining season. Between now and New Year's, and all of the holidays in between, there always seems to be a lot of getting together and sharing meals with friends. When hosting parties big or small, I love to follow Ina Garten's entertaining advice. She always advocates serving appetizers or small bites that involve very little time to prepare and very little cooking. She recommends planning and hosting parties in a way in which you can actually enjoy the party without stressing about the food. Within this framework there are still lots of ways that you can satisfy your guests (and impress them - if that's what you're going for :) Ina will serve antipasto platters loaded with great store bough charcuterie and marinated vegetables of different sorts. I've seen her go as simple as serving up shards of good Parmesan cheese. For me, I am always a fan of a cheese plate. I like crudités and dips. I'll even keep it really simple and just do GOOD quality tortilla chips and great salsa. I might spend a little more money on a few very good items, as opposed to buying and making a wide variety of things. One of my favorite appetizers are warm marinated olives. They take very little work, but still involve a small amount of special preparation and care, which makes them taste like something special. Start by getting your favorite kind of olives. I like to get them from an olive bar as opposed to canned or jarred, if possible. Then you add them to a skillet with a little olive oil and your favorite flavorings. It doesn't take much - a clove of garlic, zests of lemon, a few chilies, thyme, a pinch of fennel seeds, a little rosemary... there are a lot of possibilities. I make them just before guests arrive and they can be served warm or room temp. 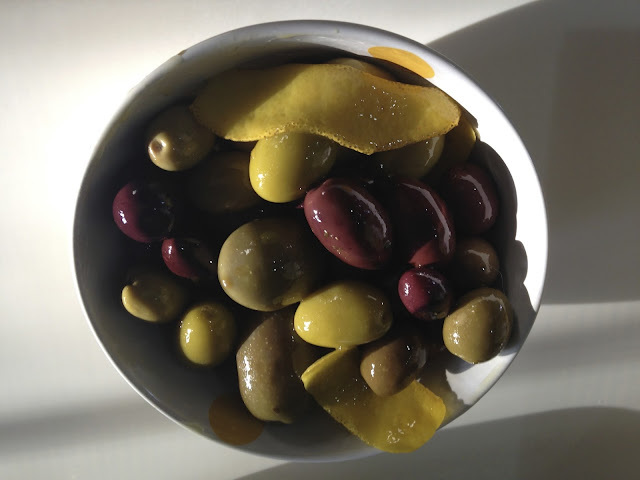 The marinade brightens up the olives and takes some of their store-bought dullness away. The oil that's left over is great to dip a crusty baguette into, too. Over medium-low heat, slowly heat up the rosemary, lemon and chili flakes in a sauté pan. After a few minutes, or once you can start smelling the lemon and rosemary release their oils, add the olives to the pan. Gently toss or stir the olives in the pan, and heat them completely through, about 6-8 minutes. Transfer to a bowl or serving dish. Serve warm or at room temperature.